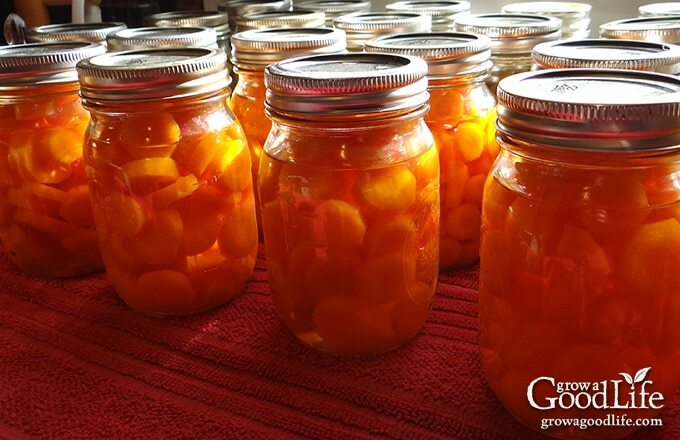 Canning carrots is a great way preserve them when abundant and in season. Jars of carrots in your pantry will come in handy for quick meals, soups, or stews. Take advantage of the seasonal harvests to stock you pantry shelves with home canned carrots. It Worked! We enjoyed fresh carrots all summer with the final late summer harvest of 25 pounds. The fall-sown carrots were also doing well and had the potential of adding another 20 pounds to the tally. I have never grown so many carrots before! With the fall carrots maturing soon, the summer harvest was canned and added to the food storage. It was nice to fill the pantry with fresh home canned carrots. Carrots and other low acid foods are preserved by using a pressure canner, which heats the contents to 240˚F eliminating the risk of food borne bacteria. One of the first purchases I made when I began gardening was this Pressure Canner. It also doubles as a pressure cooker and can be used as water bath canner with the lid unlocked. It holds 9 pint sized jars and 7 quart sized jars. Other helpful canning accessories often come as a kit like this one: Home Canning Utensil Kit. It includes magnetic lid lifter, coated tongs, coated jar wrench, bubble popper, canning funnel, and jar lifter. Of course you’ll need canning jars. I like canning carrots in pint sized jars. 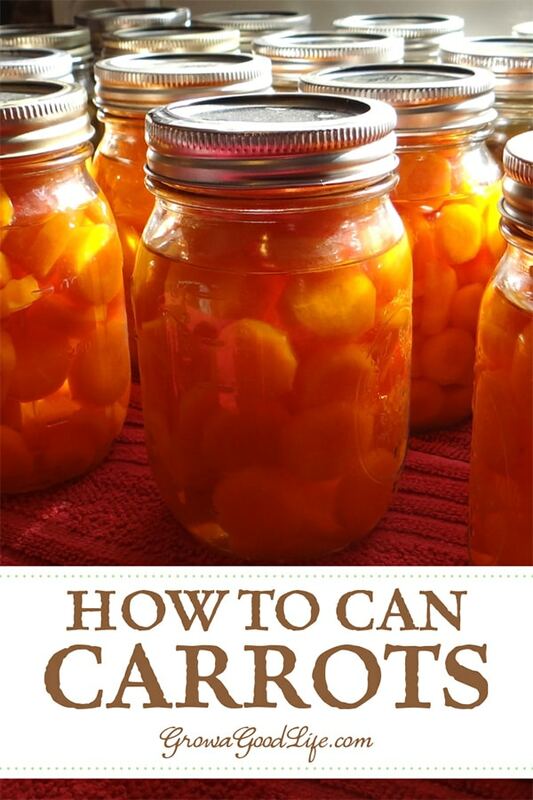 You will need about 12 pounds of carrots for a full canner load of pint-sized jars. If you don’t grow your own carrots, consider purchasing in bulk at a local farmer’s market when in season and preserve to enjoy all year. Canned carrots can be prepared quickly for meals. Since pressure canning cooks them, they only need 10 minutes on the stove to heat up. They are also easy to add to add to soups. Add the whole jar at the end of the cooking time and boil for at least 10 minutes. Plus basic kitchen supplies such as a large sauce pot, large bowl, small pot, towels, knife, vegetable brush, peeler, and a cutting board. If you have never pressure canned before, it may be helpful to review “Using Pressure Canners” at the National Center for Home Preservation website along with the instructions that came with your pressure canner. Step 1: Prepare your jars. Wash your jars and lids in warm, soapy water and rinse well. Place the jar rack into the pressure canner, set jars in the canner, add water, and boil jars for 10 minutes to sterilize. Warm lids in a small pot over low heat. Keep jars and lids warm until ready to use. Also, bring a large pot of water to a boil over high heat. This will be the water you’ll use to can your carrots. Step 2: Prepare the carrots. 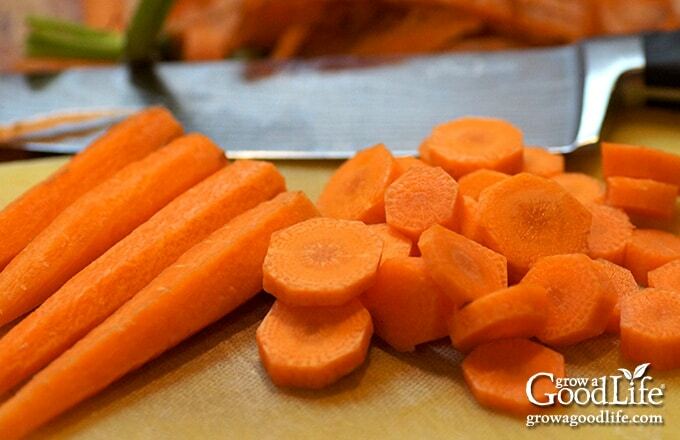 Scrub the carrots with a vegetable brush under running water, peel, and rinse again. Cut into slices, chunks, or large jar sized pieces. Step 3: Raw pack your carrots into hot jars. Remove the warm jars from the pressure canner, drain, and line up on a kitchen towel. Pack the prepared carrots into jars leaving 1-inch head space. Add canning salt if using. Ladle the boiling water from your large pot into the jars over carrots maintaining 1-inch headspace. Remove air bubbles with the bubble popper, wipe the rims, and add your lids. Step 4: Place the jars of carrots into the canner. Using the jar lifter, place jars carefully into pressure canner leaving space in between them. Once jars are all in canner, adjust the water level per your pressure canner’s instructions. If adding water, use the hot water from your large pot. Step 5: Process the jars. 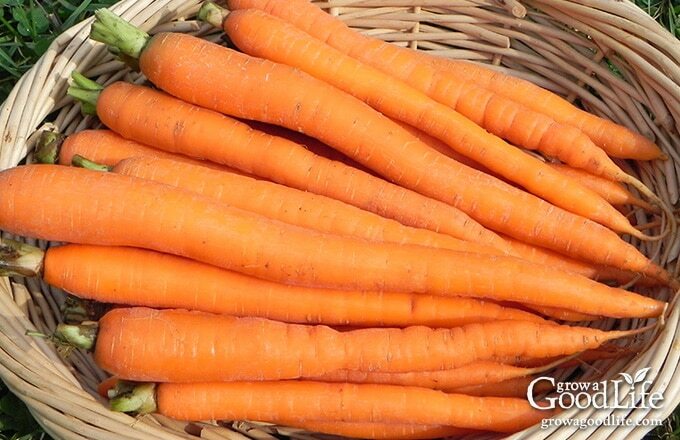 Take advantage of the seasonal harvests to stock you pantry shelves with home canned carrots. Bring a large pot of water to a boil over high heat. This will be the water you will use to fill your jars of carrots. Prepare your carrots by scrubbing, peeling, and washing again. Cut into slices, chunks, or large jar sized pieces. Spread kitchen towel on the counter. Using your jar lifter, remove warm jars from canner, drain, and line up on the towel. 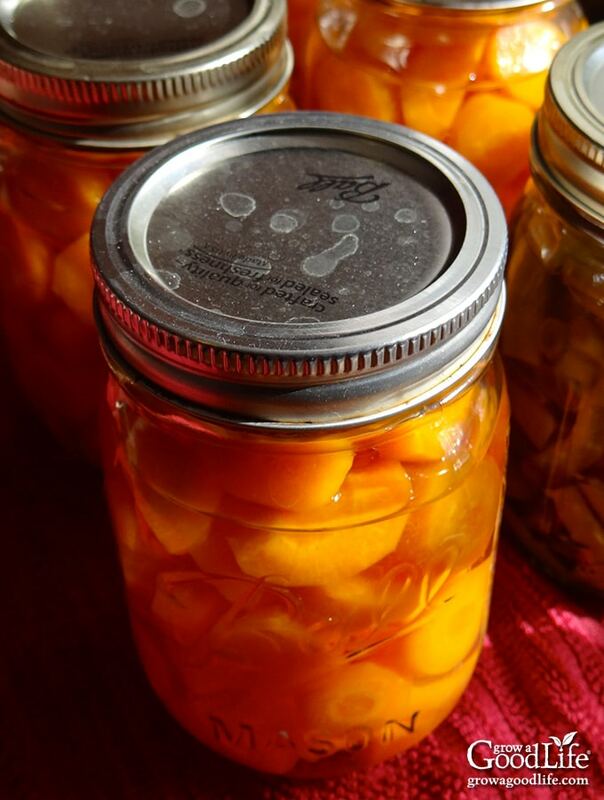 Using your canning funnel, raw pack carrots into jars leaving 1-inch head space. If using canning salt, add 1/2 tsp per pint jar. Ladle boiling water over carrots maintaining 1-inch head space. Remove air bubbles with the bubble popper and wipe the rims. Use your magnetic lid lifter to lift lids out of the warm water, center lid on the jar, and screw on band until it is fingertip tight. Using jar lifter, place jars carefully into pressure canner leaving space in between them. Once jars are all in canner, adjust the water level per your pressure canner’s instructions. If adding water, use the hot water from your large pot. Process pint jars of carrots at 10 pounds of pressure for 25 minutes at altitudes of less than 1,000 ft. Follow the directions for your pressure canner and adjust processing time for your altitude if necessary. When pressure canner is cooled down, spread a kitchen towel on the counter, unlock cover and remove by tilting lid away from you so that steam does not burn your face. Use a jar lifter to lift jars carefully from canner and place on the towel. Allow the jars to cool for 12 to 24-hours. You should hear the satisfactory “ping” of the jar lids sealing. Remove the screw on bands and wash the jars. Label and date the jars. All times are at altitudes of less than 1,000 ft. Adjustments must be made for altitudes greater than 1,000 ft. Store your jars in a cool, dark place and use within 12 months. Yields 9 Pint Jars. *Note: Several years ago, Jarden Home Brands, the company that produces Ball and Kerr canning jars and lids announced that pre-sterilizing jars and heating lids is no longer necessary when using their brand if you are processing jars in your canner for 10 minutes or more. It doesn’t hurt, so I choose to continue doing so. I use a permanent marker to write the contents and date on the jar lid. This works for my storage pantry but doesn’t look very pretty when giving away jars as gifts. Here is a way to Remove Ink from Jar Lids. Many are turned off by the idea of canned carrots, but home canned carrots are not like the mushy and metallic tasting commercially canned carrots you find in your grocery store. Just keep in mind, smaller pieces will be softer when canned. I canned about 10-12 pounds of organic carrots using this method. They came out way too soft, over cooked. What do think caused this? This was such a disappointment. Thanks. Carrots are so sweet and delicious. They are a real favorite of mine! How delicious these canned carrots look! You’ll be set for winter! Thank you so much for sharing carrot canning tips with us at the Healthy, Happy, Green and Natural Party Blog Hop. I appreciate it! Canned carrots is a favorite around here. Carrots in general is a favorite! Between my daughter and 4 horses, we can’t grow enough carrots. Wow your carrots are beautiful! I chose your post as my fave for the From The Farm Blog Hop! Thanks for sharing! So far it has been a good year for carrots here too. I am hoping the fall crop does well too. I usually store as many as I can in the frig, and freeze any extras. 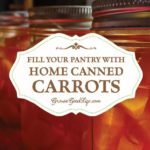 Canning sounds like a great way to handle a lot of carrots, and especially for those with larger families. Dave, I still have a few pounds in the refrigerator from the September harvest to carry us through until the fall carrots are ready. I prefer fresh, but canned carrots are very handy when you need to prepare a side dish in a hurry. Gee, I would like to have 50 pounds of beautiful carrots like that. Only 2 seeds out of 9 square feet planted to carrots germinated. Since I wanted some to dehydrate for my soup mix, I tried the local farm stand. They had none for sale since his entire field of carrots failed to germinate,so I don’t feel so bad for me (but awful for him). I don’t plant a lot of spring carrots but may try doing so next year, canning is a good idea. LOVED the tip about erasing marker from the jar lids! My carrot crop didn’t happen this year, but I bought carrots and canned them. You’re right, they’re not mushy at all, and are so handy to add to soups and stews – which is how I usually serve them. Kathi, So glad you liked the tip about removing marker from jar lids. It saved me from having to cover it up with labels. I had never tried to can carrots but sure does sound like a great idea. You have provided a lot of great information here. Thanks for sharing on Real Food Fridays. Twitted & pinned! I just can not grow Carrots in the spring so this year when I planted my greens i planted 3 packs of carrot seeds I have about 20 carrots. Please tell me how to grow carrots! I did find a 10 pound bag of carrots and I canned them. We usually eat a lot of our carrots raw, so it never occurred to me to can them (not that I could right now as I don’t have a pressure canner – yet!). But your idea for using them in soups and stews is great! Once I get that canner and have a good haul of carrots, I will definitely consider doing this. Margaret, I prefer fresh carrots and still have a lot in the refrigerator that we are eating up. The spring carrot bed provided over 25-pounds and the fall carrots will be ready soon. That left plenty of carrots to preserve for storage. Terry, I can think of a bunch of ways to use grated carrots. This is a great idea. Thanks for sharing. It is my bast carrot year ever too. I haven’t harvested any of my fall storage carrots yet. I’m not going to can them though. I’ll probably freeze some and just store some in the fridge. I might even have enough to try to store some in the basement. We will see in November probably. Daphne, I haven’t harvested any of the fall carrots yet either. I still have some in the refrigerator from the earlier harvests. I will probably can the fall carrot too because our freezer is full right now.